Love is in the air at the Arab American National Museum (AANM). On Feb. 9, children can create a Valentine's Day heart mobile during the museum's weekly Free Craft Sundays. 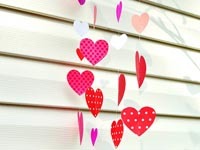 Children will advance their skills in tracing, cutting and using scissors to create three-dimensional paper hearts and then assemble a simple decorative mobile.